Cell phones are not just for talking any more. Users can engage in a wide variety of non-voice data applications using these mobile devices, and more than half of Latinos, blacks and whites reported doing so in 2010. Some 58% of Hispanics say that they use their cell phones to do at least one of the following: access the internet, email, text or instant message. This rate does not differ significantly from the rate for blacks (63%), but it is somewhat lower than the rate for whites (64%). Hispanics are less likely than whites to send or receive text messages from a cell phone (55% vs. 61%) and more likely than whites to send or receive instant messages (34% vs. 20%). The two groups are equally likely to access the internet and to use a cell phone for email. Hispanics and blacks report similar rates of texting and instant messaging, but blacks are more likely than Hispanics to access the internet and send or receive email from a phone. More than four-in-ten (41%) blacks go online from their cell phone, compared with 31% of Hispanics; and one-third (33%) of blacks use email from their cell phone, compared with 27% of Hispanics. When analysis is limited to cell phone owners, Latinos show higher likelihoods than whites of using three of the four cell phone data applications—internet, email and instant messaging. Conversely, Latino cell phone owners are less likely than black cell phone owners to access the internet from their phones (40% vs. 51%). Rates of texting do not differ by ethnicity. Survey results suggest that affordability may be part of the reason that Latinos are particularly dependent upon cell phones for internet access—but there are likely other factors at play as well. Among Latinos, the less educated and the less affluent are more likely than their more educated and more affluent counterparts to depend on a cell phone for internet access. For instance, 10% of Latinos with household incomes less than $30,000 lack a home internet connection and access the internet from a cell phone; among those with household incomes of $50,000 or more, this share is only 1%. At the same time, though, controlling for educational attainment and income does not eliminate the ethnic differences in dependency on cell phone internet access, suggesting that other factors are also contributing to the differences. Foreign-born Hispanics are generally less likely than their native-born counterparts to utilize data applications on a cell phone. Less than half (48%) of the foreign born do so, compared with 74% of the native born. This is also the case when looking individually at each of the four non-voice applications. These same patterns present themselves when analyzing nativity differences in non-voice applications for cell phone users only. English dominance is also strongly linked with the use of non-voice cell phone applications. More than three-fourths (76%) of English-dominant Latinos use their cell phones for something other than traditional calls, while 62% of bilingual Latinos and 44% of Spanish-dominant Latinos report as much. English-dominant Latinos are more likely than other Latinos to email, access the internet, and send and receive text messages from their cell phones. However, there are no language differences in the likelihood of instant messaging. And once again, these patterns persist when the analysis is limited to cell phone users, indicating that these differences are not driven by differences in cell ownership. Younger Hispanics are significantly more likely than older Hispanics to use at least one non-voice cell phone application. Some 84% of Latinos ages 18 to 29 access the internet, email, text and/or use instant messaging from their cell phones. Among Hispanics ages 30 to 44, 65% use non-voice cell phone applications, and among those ages 45 to 59, 44% do so. While older Hispanics are far less likely to use non-voice applications, a sizable minority—20%—do so. This same age pattern persists across each individual non-voice application, with young Latinos being the most likely users and older Latinos the least likely. Texting is associated with the largest differences by age among Latinos. While 82% of Latinos ages 18 to 29 report texting, this share drops to 62% for those 30 to 44, 41% for those 45 to 59, and 14% for those ages 60 and older. None of these marked age differences are due to age differences in the likelihood of owning a cell phone—the differences persist when looking only at cell phone owners. Among people ages 18 to 59, Hispanics lag behind whites in the use of any non-voice cell phone application and in the likelihood of texting. When the sample is limited to people with cell phones, Latinos ages 30 to 59 still lag behind their white counterparts in these measures. Hispanics ages 30 to 59 are more likely than their white counterparts to instant message, and among cell phone owners, Hispanics lead whites in instant messaging for all age groups. 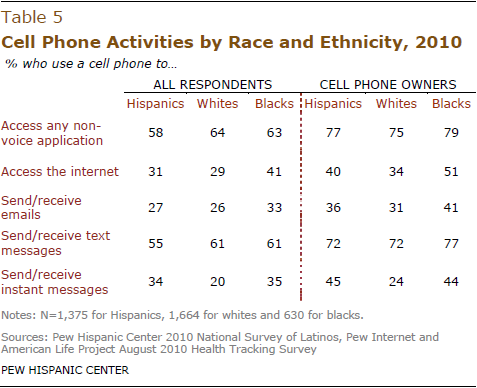 Blacks ages 30 to 44 are more likely than Hispanics in that age group to use at least one non-voice data application (82% vs. 65%), to email from a cell phone (44% vs. 30%), to text from a cell phone (82% vs. 62%) and to access the internet from a cell phone (56% vs. 34%). Most of these differences are driven by differences in the likelihood of owning a cell phone. 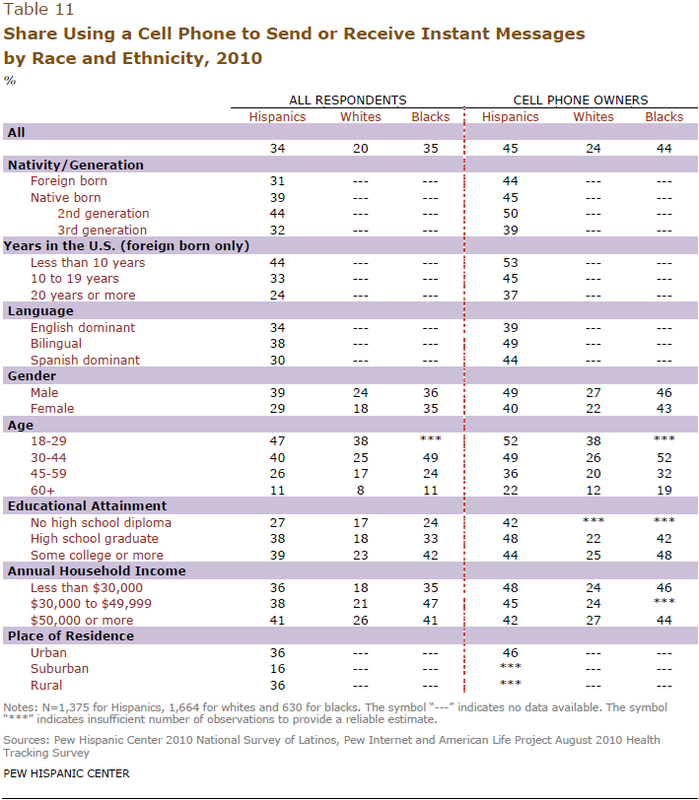 When the sample is limited to cell phone owners, blacks ages 30 to 44 are still more likely than Hispanics to access the internet (59% vs. 42%) but are similar to Hispanics on the other measures. Blacks ages 60 and older are more likely than Hispanics to email from a phone (11% vs. 3%). This difference persists when limiting the analysis to cell phone owners. Highly educated Latinos are more likely than less educated Latinos to use at least one of the four non-voice cell phone applications. For instance, while 42% of Latinos with less than a high school diploma use some type of non-voice data application, this share rises to 60% for high school graduates and 78% for Latinos with some college education. These educational differences among Latinos persist, for the most part, even when the sample is limited to cell phone owners. The one exception occurs for instant messaging; among Latino cell phone owners, there is no difference in the likelihood of instant messaging by educational level. There are no ethnic differences in the likelihood of using at least one type of non-voice cell phone application at lower educational levels. However, Hispanics with some college education are somewhat more likely than whites with some college to do so (78% vs. 71%). Among respondents with at least a high school diploma, Hispanics are significantly more likely than their white counterparts to access the internet, use email and instant message. This pattern is further accentuated when the sample is limited to cell phone owners. Hispanic cell phone owners with at least a high school diploma lead their white counterparts in the use of every non-voice application.Within educational levels, there are no significant differences between Hispanics and blacks. Among Latinos, living in a higher income household is associated with a higher likelihood of using at least one type of cell phone data application, and higher likelihoods of emailing, texting and going online from a cell phone. There are no differences by income in the likelihood of instant messaging from a cell phone. The same patterns hold when the sample is limited to cell phone owners. There are no ethnic differences by income in the likelihood of using at least one type of non-voice cell phone application, or in the likelihood of emailing or texting from a cell phone. Among those with household incomes of $50,000 or more, Hispanics are significantly more likely than whites to access the internet from a cell phone (52% vs. 39%) and at all income levels, Hispanics are significantly more likely than whites to instant message from a cell phone. 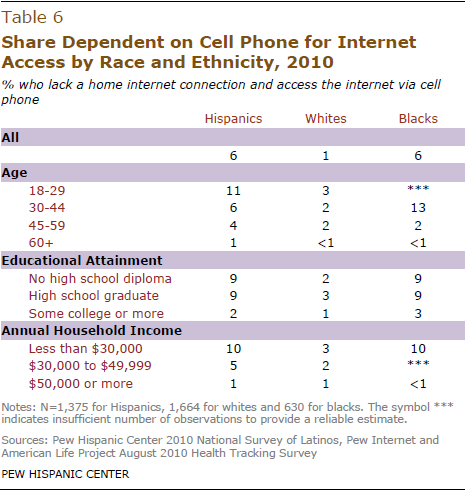 Conversely, Hispanics are less likely than blacks to access the internet from a cell phone among those with household incomes less than $30,000 (27% vs. 38%) and among those with household incomes between $30,000 and $49,999 (33% vs. 52%). Latinos living in urban areas are significantly more likely than their suburban counterparts to use some type of non-voice application on a cell phone. Some 61% do so, compared with 42% among those in the suburbs and 58% among those in rural areas. Suburban Latinos trail their urban counterparts in the use of all four types of non-voice cell phone applications. They are also less likely than their rural counterparts to use instant messaging (16% vs. 36%).